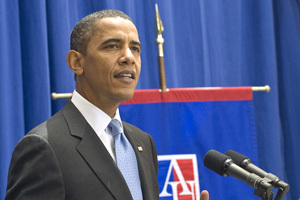 President Barack Obama at American University July 1, 2010. In July 2010, American University professor Allan Lichtman used his renowned “13 Keys” system to predict that President Barack Obama will be reelected in 2012. While dozens of news outlets covered Lichtman’s prediction when he first made it, numerous others, including U.S. News & World Report and MSNBC’s The Last Word with Lawrence O’Donnell and The Daily Rundown, have recently taken notice and covered the prediction. The 13 Keys system, outlined in Lichtman’s book The Keys to the White House, predicts the popular vote based on the performance of the party and not the use of candidate preference polls, campaign tactics, or events. The keys are conditions that favor reelection of the incumbent party candidate. The incumbent party candidate wins when five or fewer keys are false. But the other party candidate wins when six or more are false.